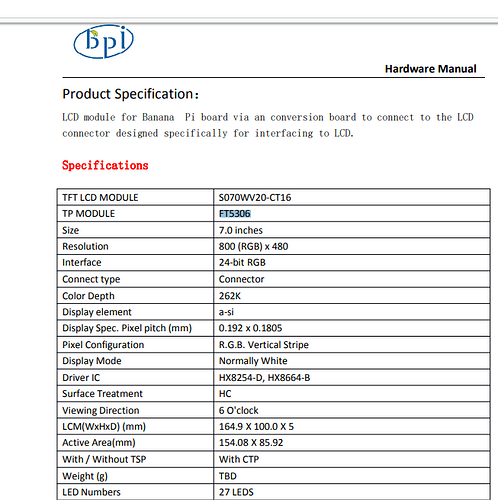 I bought the LCD Touchscreen for Banana Pi (http://www.pollin.de/shop/dt/NDE2NzkyOTk-/Bausaetze_Module/Entwicklerboards/Banana_Pi_Pro_LCD_Modul_mit_Touchscreen_7_1024x600.html). But it is not working. How I connect it to the M3? Or isnt it compatible? 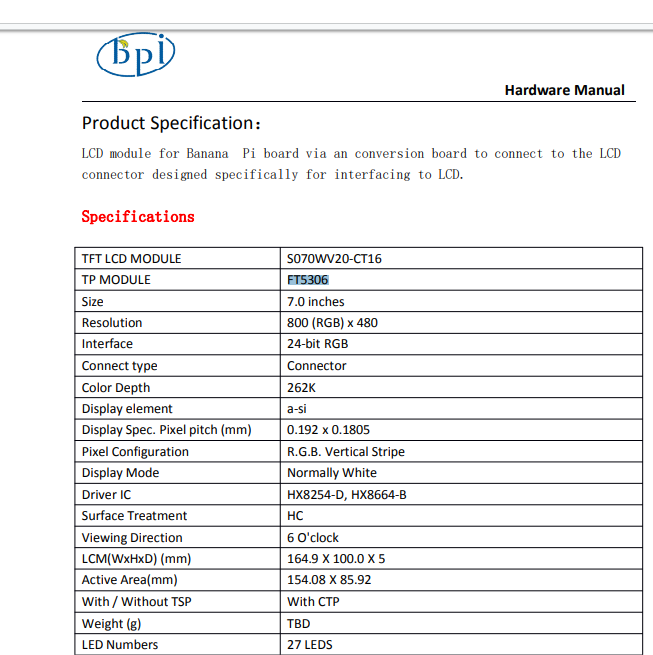 Why do you expect a Banana Pi accessory being compatible to an SBC called “Banana Pi”?! Always remember: Every Banana past the M1 is a product without any support. I want to use it with Android. And in the video where they show that Android 5.1.1 is working on BPI-M3 they use the same Touchscreen. changed 3 files with 137 additions and 27 deletions. And now have a look how old the Android image is (3 days older). And to which video do you refer where one could see that TS is working? I’m using the TOUCHSCREEN LCD 7 "S070WV20-CT16 with Banana Pi M64 and the touch screen is not working on Android 6.0.1 Release 2018-10-24! I already tried compiling the kernel 6.0.1 android 3.10 with the (bpi-m64-lcd or bpi-m64-lcd7) option and the touch screen does not work! The second problem I noticed is that from HDMI connected in android 6.0.1 kernel 3.10 (bpi-m64-lcd or bpi-m64 -lcd7), The Banana Pi M64 does not booting! Can anyone help me? Sorry my English!